« A Monk’s Chronicle: 15 January MMXVII — A Career in Hypocrisy? For as long as I can remember, history has fascinated me. Perhaps because I grew up in a part of the country where even a late 19th-century building was a rarity, I envied places where tangible traces of history abounded. But none were at hand, and so reading was the next best thing. My earliest recollection of a history book that I personally chose to read was one on Aztec history and architecture. The mere thought of discovering a lost city in some jungle stirred my imagination, and it probably explains my later receptivity to Indiana Jones movies. Not everything about Aztec culture was riveting, of course, and that’s especially true for human sacrifice. However, their accomplishments in urban planning were amazing, and a culture that was the first to make use of “zero” can’t be all bad. On the one hand the latter didn’t inspire me to become a mathematician, but it did give me a useful term for understanding some people. My dreams of becoming a Central-American archeologist never materialized, which is just as well. Even now I’ve never visited one of their jungles, not least because I don’t do well with mosquitos and humidity. Those weren’t the primary reasons for landing on medieval history, but they were considerations nonetheless. This brings me to the point. 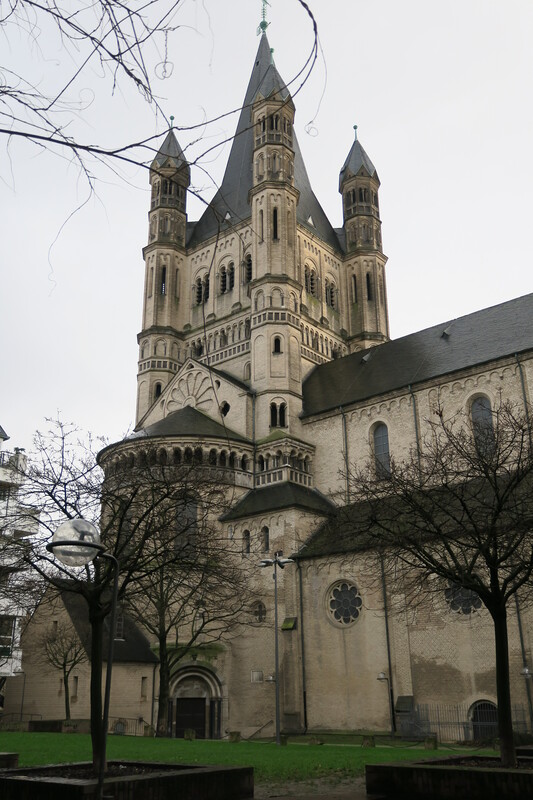 Last week I was in Germany and managed to squirrel away some time for a side trip to Cologne. I’d been there once before, twenty-five years ago, and I’d always wanted to return. It never happened, until last week. Cologne today is a shadow of its medieval self, thanks to the bombs that rained down in World War II. Despite being next to a prime target — the railway station — bombers skillfully spared the gothic cathedral, but the ancient Romanesque churches weren’t so lucky. Most of them have been rebuilt, however, and the chance to wander their aisles let me commune with long-dead citizens about whom I know a lot more now that I did twenty-five years ago. For what do I admire these people most? Certainly I admire them for their vision. They may have lacked the presence of mind to begin a pharmaceutical industry or invent television sit-coms, but they had vision, in spades. Specifically, they had the vision to build things that would last. And endure those noble structures did, until the wars of the 20th century knocked them down. I also admire them for their community spirit, to which some 15th-century statues testify. Several figures of the prophets once perched in the medieval city hall, and to all and sundry they offered words of advice. “The common good is to be preferred over personal good.” “He who dies for the community shall live forever.” I can’t imagine anyone proposing that for a government building today; but there you have it: naïveté in all its innocence. Most of all I admire them for their faith. They weren’t perfect, but they did their best, against the odds. For centuries they read the Word of God and heard it preached, and it took centuries for them to internalize answers to questions like “Who is my neighbor?” It was tough to get beyond the notion that neighborliness ended at the edge of the village, but they did. Would I want to go back in time and live in the 12th century? Not a chance. I may be a historian, but I’m not a hopeless romantic. That said, I do love their Romanesque churches, much as I treasure their architectural descendents on the campus of Saint John’s. But I also have a practical streak, and I happen to like indoor plumbing and central heat. Long ago I realized that living in Northern Europe in the 12th century is much like living in a cabin in the north woods. Year round. For a life-time. No thanks. Beyond that, I appreciate the challenges that they faced, but I appreciate even more the wisdom that they bequeathed to us. Today we have challenges that they could scarcely imagine, but they have wisdom that’s still useful — even to us. 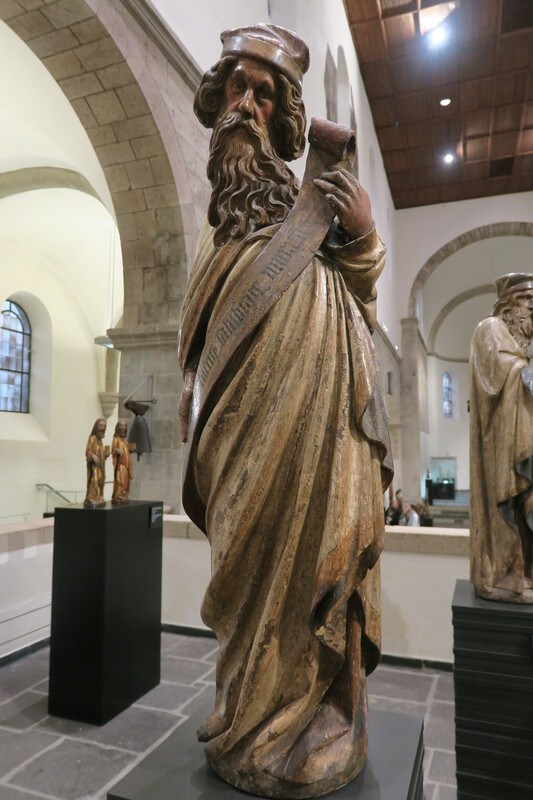 Yet another of those 15th-century statues comes with this bit of sage advice for all citizens: “First seek the kingdom of God and his justice.” I — and we —could do worse. +As today’s post indicates, the major event of the past week was a trip to Frankfurt, with a side venture to Cologne. The latter trip shattered my myths about the faultless reliability of German trains, alas. My train left Frankfurt twenty minutes late, and at Koblenz — the half-way point — it stopped because of difficult weather further ahead. The conductor announced a one-hour delay, and that morphed into two hours, then three, then four. At that point they announced that, due to severe weather, no trains were going to Cologne. Our train was cancelled, and so I had no option but to find another train and go back to Frankfurt. What did I do for four and a half hours on a train parked in the Koblenz station? Crossword puzzles. Don’t leave home without them. +From January 18-21 organ-builder Martin Pasi visited Saint John’s to begin work on the expansion and completion of the organ in the Abbey church. On the 20th he joined the monks in the refectory for lunch. +The photos in today’s post omit the obvious symbol of Cologne — the cathedral — simply because that will come in a future post. 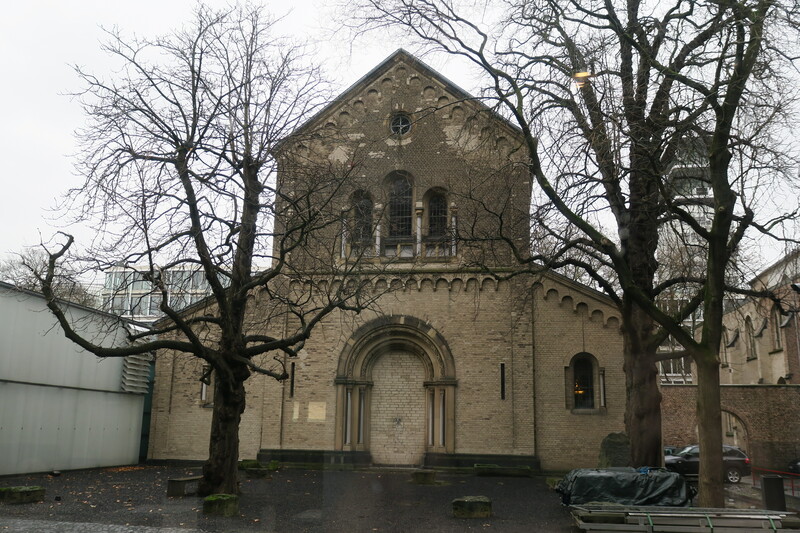 For now I am content with a sampling of some of the Romanesque churches that sprinkle the core of the city. At top is St. Maria im Capitol, followed by Great St. Martin and Saint Caecilia. 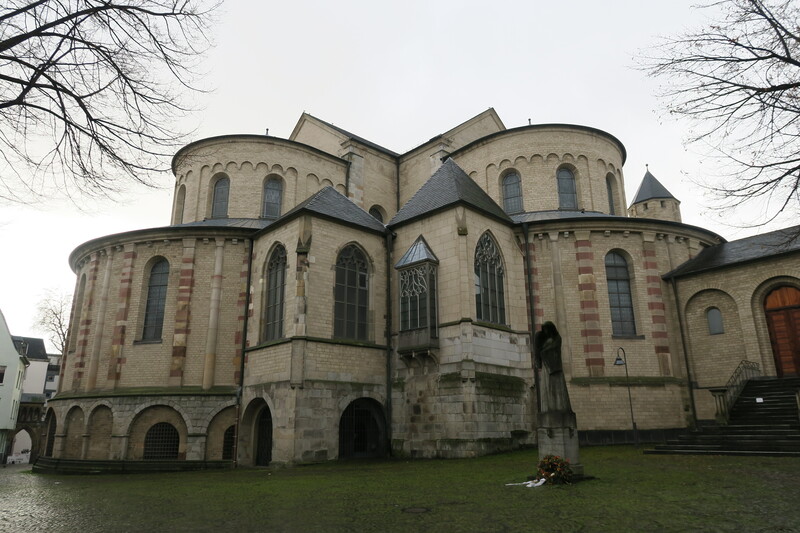 Today Saint Caecilia houses the Museum Schnütgen, which is a vast collection of medieval art. 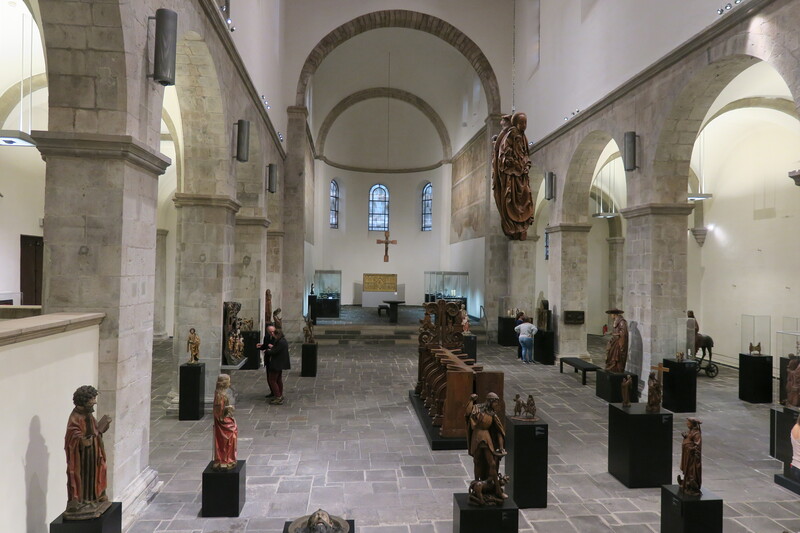 In the collection are eight statues of prophets that used to stand in the medieval town hall, including the photo of one of them, holding a scroll which reads: “No one shall gossip outside the Council.” At bottom is the interior of St. Caecilia, which comprises one of the many galleries in the Museum.